You have reached the voting thread for Round 62. The theme for this round was Indoor Pursuits or Games, and was chosen by our Round 61 winner, Lejays17. Please cast your vote for your favorite from the following three entries. Voting closes on April 4. The person whose photo entry receives the most votes during the voting period will get to choose the theme of the next round. In Elfy's pic, does "checkmate" mean "off with his... or her... head"? I'd be more concerned if the Queen was one of the two players. Very nice job everyone! 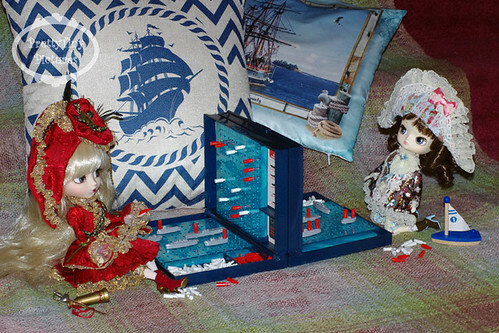 Love the sea battle, Alliecat, great bit of fun. (04-02-2019, 12:10 PM)Cornflower Blue Wrote: I'd be more concerned if the Queen was one of the two players. 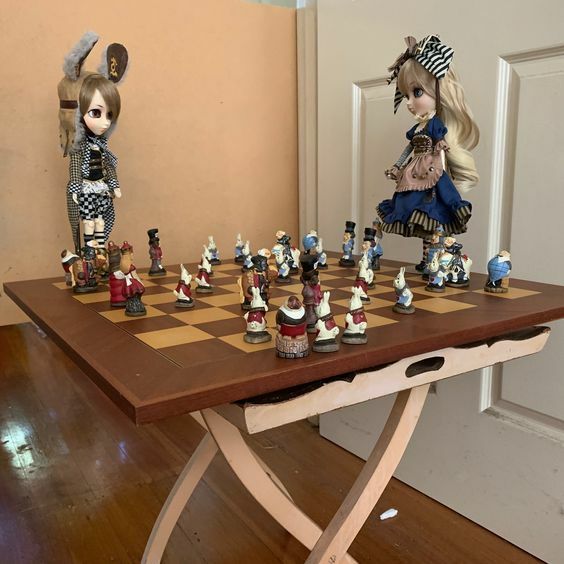 Elfy's chess set is perfect for the dolls' theme. Isn't it interesting how each activity coordinates with the dolls' outfits? 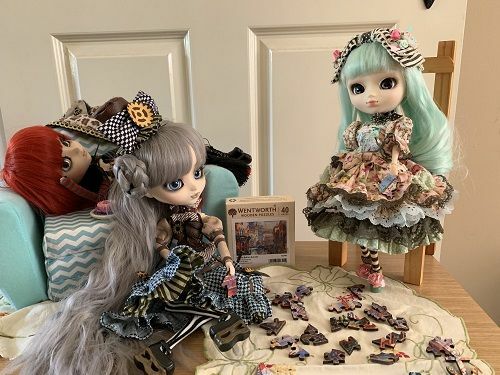 That Crimson Veritas with her vibrant red is hitting those ships, then there's the Alice in Wonderland chess theme, and lastly even the puzzle ties in with the dresses (especially Alice Mint Du Jardin's)! Also interesting to note that while two photos featured two Steampunk World dolls, no same doll was used twice. And not only that, every doll is dressed in their stock outfit. FYI: I'm only the *NatTheCat* on Dolly Market and Den of Angels. I have username twins on other sites, but they're not me! Dolly size puzzles?! How cute! I remember long hours of puzzle-making too. Interesting coincidence with everyone wearing their stock outfits. I didn’t pick up on the stock outfit. I loved Allie’s naval battle and Lejay’s lazy Sunday of jigsaw making. Congratulations Elfy--looks like Checkmate was the favorite photo this round. Once you've decided on the theme for the next round, just shoot me a PM! Wow! Thank you, I’m honestly quite flattered. I’ll have a think about the next topic and send it to KiraKira as soon as I have something. Congrats, Elfy! Looking forward to the next theme. Hopefully I'll find time to chime in. Well done, everyone. Congratulations, Elfy! The game is yours... this time! Congrats! That was such an interesting photo!